The nature of reality is a tricky one for television producers. It is clear that genre hybridisation is the central thrust of shows like Britain's Got Talent and I'd Do Anything where the talent show collides with variety and the 'soap' anxieties of 'real' people who are participating in such super-genre shows either as contestants or even as members of the audience. Forest Of The Dead quickly, and rather dully, dispenses with its cliffhanger resolution (the bloody squareness gun again) but as a result opens up a door in the narrative that takes us to a reality in which the very act of watching, making and editing television is commented on and then juxtaposed to the fiction of the Doctor Who universe with a child watching the Doctor's adventures on TV. Forest Of The Dead, as the series own collision between reality show, adventure and romantic fiction and soaps, suggests the jump cuts in Donna's new reality are the jump cuts imposed by an eager child surfing through programmes and channels with a television remote. Moffat's take on virtual reality has much to say on our own perception of the kind of lives we lead and this is by far the most interesting concept at the heart of the episode. It takes the series well outside of its normal boundaries and with its digital children questioning their own existence offers an uncomfortable and disturbing insight into how we love and are loved in return. Donna's fictional life, and Catherine Tate's superb playing out of its tragedy, is echoed by the lynchpin plot turn of Lux revealing that he isn't a hard hearted business man but simply a relative searching for a lost and dying child protected in a computer created reality. As well as this, Moffat also riffs on the out of time romance of The Time Traveller's Wife and the relationship between the Doctor and River Song is the episode's other narrative triumph as it mimics the notion of julia Kristeva's concept of 'women's time' where narrative structures are built around the cyclical nature of changing seasons or the natural cycles of reproduction. Here birth becomes death and vice versa and narrative is folded in on itself in an unorthodox attempt to return the Doctor and River Song to the moment before loss, before death. This also plugs into Bakhtin's idea of the chronotope - a time-space in which the conscious mind frames and organises the real (the library) but it can also be the time space where it disorganises and re-presents the real (virtual reality). The chronotope allows shifts in reality and features in pretty much all of Moffat's scripts as his mind-bending observations on the nature and structure of time and space. It is also interesting to note that it is Miss Evangelista who unpicks the virtual reality of Donna's life and the progression of 'women's time'. Virtual reality in the story is dominated by the feminine and the female with Evangelista as literally a digital distortion in the episode's most powerful reveal. In my review of Silence In The Library I made the point that Moffat seemed to be recycling a number of his own tropes and this second part of the story very much recycles the 'everybody lives' coda of The Empty Child/The Doctor Dances and here he further postulates on some ideas about what an afterlife might be and that it may well be a sort of heavenly download for the dying soul. But it is an afterlife that is rather disturbing and blunts the positivity of The Doctor Dances and its joyous 'everybody lives' narrative climax. He may be cleverly riffing on his own ideas here but should he undo the satisfying coda he wrote for that episode in the process and propose neither life nor death at the hands of the Doctor but instead a kind of living death in the library's hard drive? I also felt he undermined the stunning scene of River Song's self-sacrifice and the Doctor's loss, which we all knew was coming and was one of many elements - the hard drive saving the visitors, Dr. Moon as a kind anti-virus/reboot programme - that we'd already second-guessed him on last week, by using the 'cheating death' epilogue involving the sonic screwdriver. You could argue that it isn't cheating death at all because River and her crew are, in effect, still dead. But I've a sense Moffat is providing himself with some insurance so that he could bring the character back easily if he so desired. It's almost as if Moffat can't bear to let the tragic really remain tragic - he intervenes here with River Song's death as much as he requested Russell T Davies to not kill off the abomination of Jenny in The Doctor's Daughter. Can we just put the Doctor through the emotional wringer and be done with it? I suppose River is different in that she exists in the Doctor's hypothetical future that's already been hinted at and might be properly described in future episodes. Donna very much comes off the worse in this situation. Her kids may have been digital creations but her husband Lee was one of the surviving visitors and it was achingly sad that at the conclusion they both were whisked away from each other. Tate's performance in the alternate life of Donna is nothing short of brilliant and both she and Alex Kingston actually outshone David Tennant this week. Tennant's exuberance is wonderful but he spent a lot of the episode rattling off various info dumps at such speed that many of the scenes lost focus and clarity and I suspect a lot of the concepts, and his delivery of them, would have left many younger viewers confused and, in the end, somewhat indifferent. 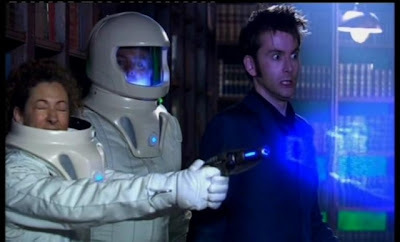 There were an awful lot of ideas that Forest Of The Dead packed in with a slightly detrimental effect on Tennant's blustery performance even if in the end it worked merely as a reflection on the Sky+ record and rewind, edited highlights of Donna's life in the hard drive. Life is complicated and you often don't get to edit out the bad, confusing or boring bits its seems to say. But I forgive him his over-ebullience of delivery just for that sublime and far subtler interplay with Alex Kingston. What fails here is the rather unsatisfactory use of those flying piranhas of the air, the Vashta Nerada. It's a great concept but their threat is hurriedly dealt with in that rather ineffective scene where the Doctor tries to reason with the Vashta Nerada and finds out they came as microspores in millions and millions of books and then hatched. He just tells them off and they go away? Their threat dissipates completely from that point on and they are reduced to being the story's MacGuffin rather than being part of its central narrative in the way that the Weeping Angels were in Blink. Rather, Moffat is more interested in the 'romance' between the Doctor and River Song, the wibbly wobbly timey wimey stuff and narrative construction. The pell-mell pace of Forest Of The Dead rather begs the question that with a bit judicious editing the entire story could have been told in 45 minutes and it may be a clue as to why the pace of Silence In The Library was so sluggish where he obviously recycled any number of his motifs in it. Whist it might struggle to be comprehensible, it's still a powerful, intelligent episode (best of the series this year, no doubt) and, as an emblem of narrative complexity, will reward repeated viewing. As a two parter it suffers from structural and pacing problems, with a very slow first 45 minutes followed by a desperate race to the finish in the final 45 minutes. As an hour long finale this would have been absolutely great but the longeurs of Silence In The Library with its misdirected focus on the Vashta Nerada don't dovetail well enough with the central conceit, at the heart of Forest Of The Dead, of the Doctor meeting his future wife only for it to be the last time he sees her. It's got bags of rich ingredients and some very interesting ideas about reality, love and death but the resulting pudding is only properly baked on one side. These more conceptual episodes only work in relation to the other stories that surround them and it would be disastrous if Moffat, as head honcho, made an entire season of them. I believe his comedy writing talents and his flair for misdirection will allow him to prove otherwise and Series 5 may end up far and away removed from the expected Hinchcliffe Mark II that many fans are already salivating about.